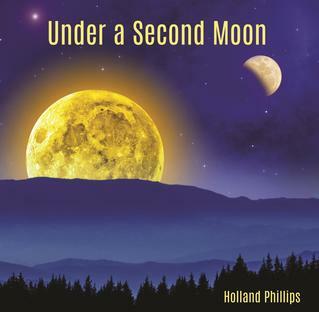 Around the same time last year, I got some music in from Holland Phillips. I had the pleasure of hearing and reviewing his Circles of 8 recording. It is now 2017 and Under A Second Moon is getting set to arrive on our doorsteps. Where Holland began his first journey he now continues, well in fact he never stopped. He just kept creating and recording. Again, he decided to concentrate on harmonics and vibrations. The results are superlative once again! The production values are top notch and the use of keyboards and synths are brilliantly utilized by this creative maestro. Holland is not only a musician but an author as well. This is an outlet, a place where anyone can escape to. If its fantasy or real, or just a space in time to occupy for you to recharge your batteries, it is available through this music. Each track seemingly blends into the next, gently beckoning your soul to participate in this atmosphere of sounds, textures and wonderlands of the mind. And most importantly it belongs to you the listener. Here is your chance to create your own little slice of heaven through music. I believe Holland is an excellent composer, a multi-talented artist that can paint a picture visually with either words in a book or through his fingers into the instruments he uses. I found Under A Second Moon to be a very pleasant listening experience and just as enjoyable as last year’s offering. This a coloring book for the soul, the music are your crayons and you are the book. The title track was the one song that cemented the concept and meaning of this project for me, it colored my heart and mind. Adding the saxophone (Paul Christensen) was the finishing touch. And this was at the midpoint of the recording and I was already thinking that it could not get much better. That track was hard to top however the consistency and quality of the music held up as the stories weaved their spell throughout each succeeding track. Each track was a different shade or color, a variation of moods that danced with the music. It all made me feel invigorated, joyous and glad to be alive. I do not always feel that way so once the magic of music casts its spell and it won me over again. Interesting enough “Long Way Home,” reminded me of early progressive rock or even band’s like Tangerine Dream and Kraftwerk. I would really like to hear more of that style on the next album. Thanks again for the trip far away from stress and worry Holland, your creative genius soothes my soul and wets my appetite for your next project.